Identifying and dating Capodimonte porcelain can be somewhat confusing until you understand the history of the Royal Factory in Naples, Italy and see examples of the different types of wares made there. Knowing which marks were used during different time periods also helps to date Capodimonte porcelain pieces. Take care when examining these marks, however, since several of them look very similar. Below are examples of several different marks used by the original factory, along with others from the numerous companies that rekindled the Capodimonte tradition the 20th century. More information on these new makers, which manufactured most of the Capodimonte discovered by collectors today, can be found in Capodimonte Collectibles by Catherine P. Bloom (out of print, but available online through used booksellers). This is the first mark used by Capodimonte in the mid-1700s at the Royal Factory in Naples established by King Charles VII. Prior to this mark being stamped on wares ranging from figurines to tableware, pieces made by Capodimonte were all unmarked. This marking was usually stamped in either blue or gold on the bottom of pieces made during this era. Some pieces were impressed or incised with a similar mark. Most examples with this stamping are considered to be rarities and are held in private collections or museums. They are seldom found by collectors on the secondary market today. Like the earlier fleur de lis mark shown above, this one was stamped in blue or gold on the bottom of pieces made at the Royal Factory in Naples. This mark was used until 1771 when the crown over Neopolitan N mark shown below came into use. Again, most wares bearing these old marks are in private collections or museums and rarely found by collectors on the secondary market today. 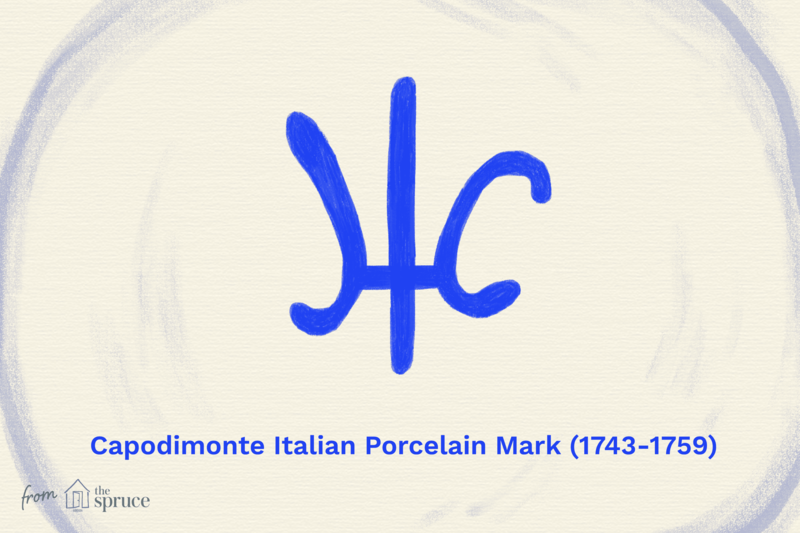 This mark was stamped in blue on a variety of pieces including decorative objects and tableware made in the second Capodimonte factory to be established in Naples by King Charles VII’s son, Ferdinand. This is the mark most often associated with Capodimonte by dealers and collectors. It was used from 1771 until the factory closed in the early 1800s (some sources indicate a closing date of 1817, others purport 1834). 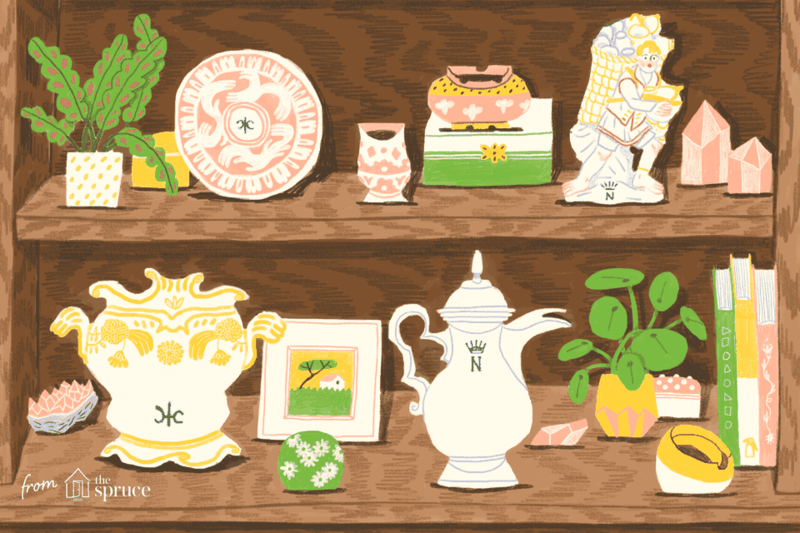 Pieces marked in this way occasionally make their way into the secondary antiques market, usually at high-end antique shows, and are highly prized by collectors when found in excellent to mint condition. Since the 1920s, other companies have made and marketed items as Capodimonte. Some of these are indeed fine porcelain and marked Capodimonte made in Italy somewhere on the piece. Many of them have some variation of the crown over Neopolitan N mark in their stamps (as shown here); others more fully identify the factory where they were made or their designer. Some marks simply read Capodimonte Italy written in gold, and the quality of these pieces varies widely. These are the marks collectors will encounter most often when shopping for Capodimonte today. These pieces were not made at the Royal Factory prior to its closing in the early 1800s, but a select number are still highly valued by collectors if the craftsmanship is of high caliber. Others more commonly found are poorly decorated and worth far less. These range from fine figurines to beautiful flowers. Less desirable home shopping channel items and those made of resin also fall into this category, and their value is usually quite low. In addition to being stamped with variations of the crown and Neopolitan N mark, along with made in Italy and the name Capodimonte, a number of companies used sticker labels to mark pieces made throughout the 20th century. When these are still in place, it makes identifying and dating pieces much easier. Of course, these were easily removed or wore away with use over time. The label shown here identifying Napoleon as the maker of a finely crafted flower made in the Capodimonte tradition exemplifies this type of label. Once the labels are removed, the item is then deemed "unmarked" although it may still be recognizable as a late Capodimonte piece. Is That Really a Beehive on Your Royal Vienna?